Current work on speech pragmatics and visual thinking calls for a radical reassessment of the problem of obscurity or difficulty in Robert Browning’s work. In this innovative study, Bailey reinterprets Browning's life and work in the context of contemporary theories of language and attention, drawn from the cognitive sciences. Specifically, new readings of under-examined historical sources show the extent to which Browning’s cognitive and perceptual worlds differed from the norm, aligning him with Victorians like Sir Francis Galton or fellow-artist William Wetmore Story. 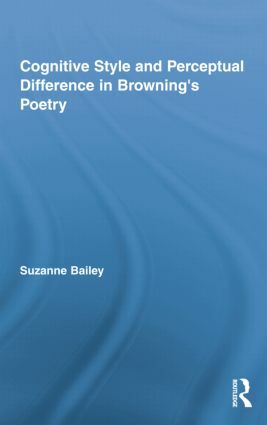 Exploring how perceptual biases are transformed in the language of the poems, Bailey demonstrates how the cognitive sciences can ground a new biographical practice, drawing attention to such matters as the creative process and the ethics of understanding individuals who think differently. In doing so, she re-energizes debates about this unusual Victorian poet, his later works, and the nature of literary style. Suzanne Bailey is Associate Professor of English at Trent University.